Recent research has shown that customers are more likely to buy from retailers who personalize their shopping experience. In addition, online consumers get frustrated when websites offer content that has nothing to do with their interests. It is quite clear from these studies that a personalized website is definitely an advantage to any online merchant or entrepreneur. Website personalization accounts for different motivations, devices, geographical locations and time constraints for a user. By making use of the current advanced technology, marketers can now assimilate specific information about what a website visitor, thereby translating their visit into a higher conversion. Different users should be served with different content. A returning visitor can be tracked using cookies so that they can be directed to the most appropriate and relevant page, making the site navigation easier for such users; whereas, a first time visitor to the website is usually looking for different information than someone visiting the site repeatedly. To increase the conversion rate of first-time visitors, one can include a video tutorial, for example. This video tutorial will explain a particular product or service to the user. 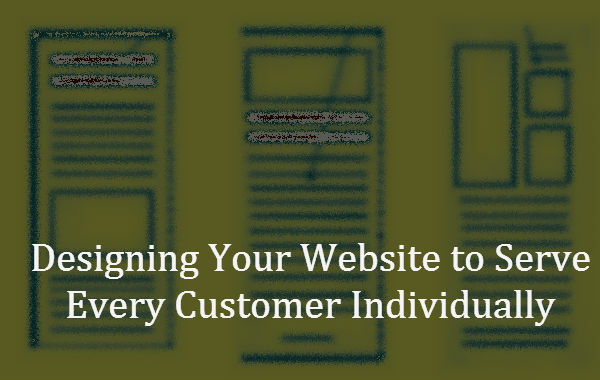 Other ways include giving your business address or a contact form to capture leads. If you can know the user location at the time he/she is visiting the website, it can prove to be a real game-changer. Although, it was possible to follow a customer’s individual buying journey online and optimize it at every step, it was not possible to use these insights in the offline interaction. But now, with geo-location, it is possible. If someone is few blocks away from a store and searching for its related offered products online, the chances of conversion increase if the customers are offered with a business address and a discount coupon, for example. Take restaurants as a second example. An OpenTable button to reserve a table, or a Google Map app that offers step-by-step directions to the store are crucial to conversion. Changing the content on a website according to different times of the day, week or even season can increase conversions greatly. Also, updating content based on different occasions or events such as festivals or the like affects the conversion rate. For example, replacing your business phone number on your website with a contact form in the non official hours will help you avoid missing out on potential customers who want to reach to when your business is closed. This ability to offer different products or services over the course of a day based on trends, habits or culture increase conversions. For example, a restaurant offering a different menu along the day as they switch from lunch to dinner can reap great benefits. Recognizing special events like Valentine’s Day, Christmas or even Halloween, is actually a great way to personalize user experience on website and better connect with the customers. You can change the website theme to hearts during Valentine’s week or add an image of Santa during Christmas. This could have a positive effect on customer engagement, and boost conversions. The content on the landing page should be offered according to the destination source that directed that visitor on the website. This is crucial to providing a seamless and consistent experience to the visitor. For example, customers that come to your website from an email marketing campaign or from a referral site should receive dedicated messaging that is aligned with the message they viewed in the email or the referring site. Offering a coupon could also be a good idea at this point.